i mentioned that on our family vacation, my brother-in-law shared a homemade donut recipe with us. i am not a huge fan of donuts normally, but i loved these because they were light and fluffy. most donuts seem kinda heavy, so i loved that these were light. 5 - when the oil is ready, use tongs to place a donut into the oil. cook it until one side browns, then flip and brown the other side. pull it out and put it on the cookie sheet to rest. repeat with each donut. 6 - have a second person to work the cinnamon sugar while the donuts are cooking. let each donut rest for a few seconds after cooking, then place into the bowl and spoon cinnamon sugar on top. once the donut is covered well, move to a plate. repeat with each donut. 7 - enjoy some delicious, light, fluffy donuts! - it moves pretty fast, so once that first donut is cooked it will only take a few minutes to finish them all. - it is best to only try to cook 1-2 donuts at a time. since they cook fast, you could end up with one being overcooked and one being undercooked if you lose track. 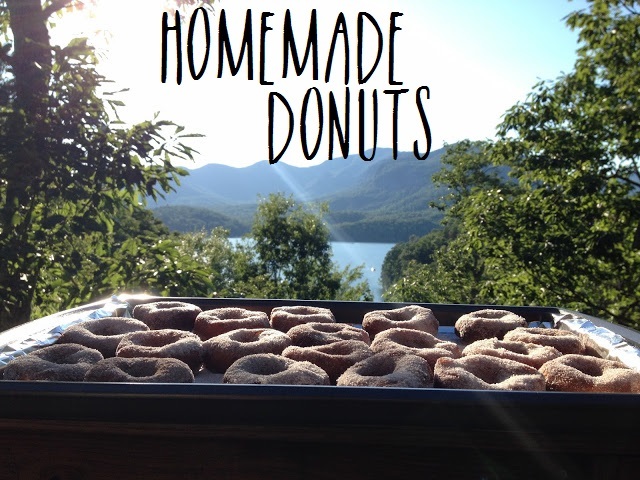 have you ever made homemade donuts? what's your favorite recipe for them?